How do I Request that Staff Read a File? Navigate to your Files tab. Here, you will find all the files currently uploaded to your company's shared files page. Hover over the file you wish to move into a folder and click on the green cog icon to the far right of the screen. Clicking Reads will open a new dialog box. 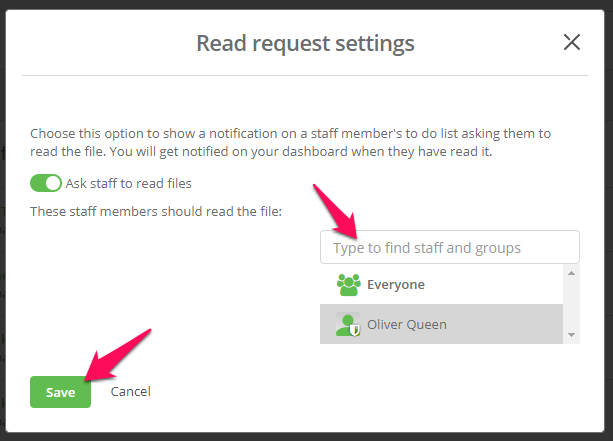 If the Ask staff to read files toggle is off, first click this to turn it on, then select the staff members or groups that you would like to send read requests to and click Save. NB: You can also switch off the toggle to remove all read requests from the staff member's profiles. Read by x of y will then appear next to the file you have asked your staff to read. NB: See who has read a file and run a Read Files report. Where can I find the Read Files Report? Admin: Can I Share my Files with a Third Party?